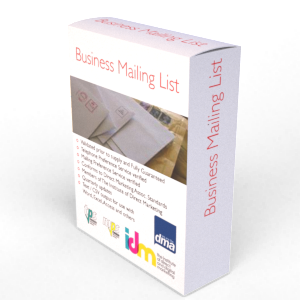 The very latest Birmingham postcode address list that can be used for direct marketing including direct mail and data cleansing exercises. This is the only official address database sourced directly from Royal Mail. There are two product options available the UK file or the B postcode file (all addresses and postcodes for Birmingham). This provides you with every postcode and postal address in the Birmingham postal area! Otherwise known as the PAF file, it is without any doubt the definitive most up-to-date and complete address database in the UK. There are two product options: the UK file which has every address and postcode in the UK (28 million addresses both business and residential) OR just the addresses in your postcode area, which is the cheaper more address specific / smaller file. Consider adding a Birmingham B Postcode Map - ideal for tracking sales, plotting customers, drawing sales areas. The Birmingham postcode address list / PAF, is often used to capture, create and or maintain your in-house address lists pre mailing. This includes web site registrations, forms and customer databases to reduce the number of returned or undelivered items from mailing programs. Obviously there are many more applications that you can use the PAF file for including mailing, planning leaflet distribution, logistics, navigation to name just a few! The Birmingham postcode address list / PAF covers every known address in the Birmingham Postcode Area (B). A sample of the PAF can be found by following the link at the top of this page, this will also provide you with the data fields that are provided for each record. The Birmingham postcode address list / PAF is supplied as a Comma Separated Variable (CSV) delimited text file using double quotes by default. This field format will open very easily using almost any software application including but not limited to Excel, Word, Notepad, Access, SQL etc. Due to the size of the file, older versions of Excel may not be an option as Excel limits any file size to around 65,000 rows / records. The Birmingham postcode address list / PAF is by default emailed at the time of order using a secure download link delivery method. If you require the PAF supplied in another format then we will be more than happy to accommodate you where humanly reasonable to do so at no extra cost. Birmingham postcode address list / PAF is licensed annually for each user that has access to it. Options for system licences and internet licences are also available. The Birmingham postcode address list / PAF is the most up-to-date and complete address database available for Birmingham addresses containing a mixture of business and residential sites. For your licence fee you will receive the very latest file which will be valid for 12 months use and this includes quarterly updates to ensure it stays up to date.